NM State (18-7, 11-1 WAC) is two games up on Bakersfield with two games remaining in the regular season, meaning an Aggie win or a Roadrunner loss over the last two games and NM State will be the outright WAC champion. The Aggies picked up their 11th-straight win at home and have won 18 of their last 20 games en route to winning their first WAC championship in the 10 years as part of the conference. But it wasn’t easy as Grand Canyon (11-13, 5-6 WAC) led for most of the second half and took a one-point lead with 10.5 seconds left in the game. It took a shot in the lane by Aggie sophomore guard Tamera William with 2.9 seconds left and a missed desperation heave by the ‘Lopes to finally give NM State the wild victory. Point guard Shanice Davis drove the lane, drawing the Grand Canyon defenders, and then dished out her third and final assist outside to William who also drove the lane and sank the winning bucket. The Aggies were down seven at 56-49 with 3:31 left in the contest but finished the game on a 12-4 run to steal the conference-sealing win. NM State scored eight-consecutive points, beginning with a Sasha Weber 3-pointer and ending with a Brianna Freeman free throw, to take a 57-56 lead with 57 seconds left. Weber and Freeman each finished with a game-high 17 points. Freeman added a game-high 14 rebounds for her seventh double-double of the season, including six in WAC play. Weber, meanwhile, sank three 3-pointers on the day to break a tie with assistant coach Cecilia Russell-Nava and pass former Aggie Sinnamonn Garrett for third place on the NM State 3-pointers made in a career list. The ‘Lopes would retake the lead with 37.2 seconds left, just to see Weber make a driving shot and get fouled to give NM State a 59-58 lead with 23.4 seconds remaining. Weber would miss her free throw, however, as Grand Canyon took its final lead on the ensuing possession. The Aggies’ biggest lead came in the first portion of the game as a 9-0 run gave NM State a seven-point lead at 13-6 with 11:48 left in the first half. The ‘Lopes would hang around, however, and would overtake the Aggies 20-19 with 5:32 left in the half. Sophomore guard Moriah Mack, who finished with 14 points and eight boards, seemingly all at critical points, would knot the game at 23-23 with four minutes to go in half number one. Grand Canyon would finish the half on an 8-4 run to take a 31-27 lead heading into the locker room. Davis would score the first five points of the second half to give the lead back to NM State, but later in the final half Grand Canyon sprung a 9-0 run on the Aggies to open up a double-digit lead at 45-34 with 11:40 left. But as it has done all season long, NM State did not let a late big deficit bother them, and as always it was contributions from the whole team that brought the Aggies back. At the under-8 media timeout the lead was down to a couple of points, 47-45. The ‘Lopes would increase their lead to seven over the next four minutes, setting up the thrilling final minutes. 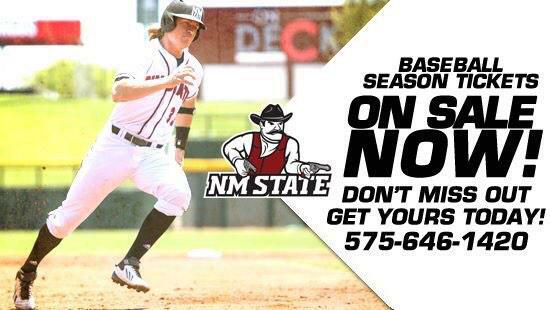 ﻿NM State now looks to clinch the WAC title outright with a win next Saturday versus Texas-Pan American. The Aggies will celebrate Senior Night as they meet the Broncs during the final home game beginning at 7 p.m.